Welcome to this week’s edition of Player of the Week. Ryan Miller gets the nomination this week, which is tricky because he played in only one of two Canucks games since last week’s POTW. (It’ll be nice when there’s more than one or two hockey games in between posts, but I digress). The biggest reason Miller deserves this week’s nomination is the shutout he posted against the Edmonton Oilers on Friday at Rexall Place; he made 28 saves to notch his 30th career shutout. Miller’s shutout also handed the Oilers their fifth loss of the season and their worst franchise start in history (0-4-1), which all Canucks fans can agree is pretty great. And, while Miller’s first shutout of the season was only against the Oilers, he improved his personal record against the ‘dynasty club’ to 9-0-0. One of the biggest reasons why Coach Desjardins gave him the start, I’m sure, but it makes you wonder why the Miller, Canucks’ number one goaltender, didn’t get the start against the Tampa Bay Lightning – a, shall we say, ‘legit’ team in the NHL. Miller’s also 3-0-0 on his season so far, with a save percentage of .927 and a GAA of 1.95 – pretty solid coming from a guy who’s looking to rebound this year with a new team. While it’s not all Miller’s doing — he’s had some help up front to score goals and better defence than he’s used to in Buffalo, he’s having a solid year, early on, and I’m finding it hard not rooting for the guy. I had my reservations at first, but I opened up to the idea of him as our number one goaltender rather quickly; believing in and rooting for him is better than the alternative. 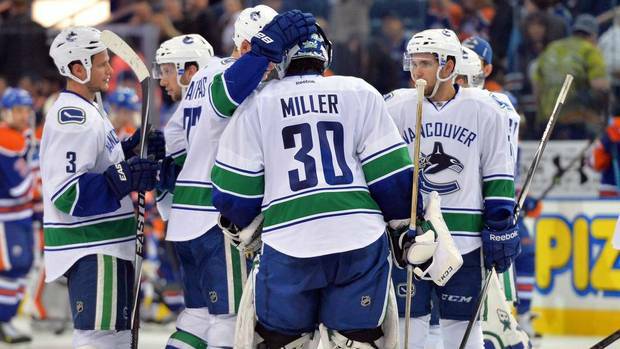 It’s no secret that Canucks fans are fickle, that Vancouver is a designated goalie graveyard and anything a goalie does wrong here they’ll carry it with them to their grave, but I’m on Miller’s team. Miller time, if you will.